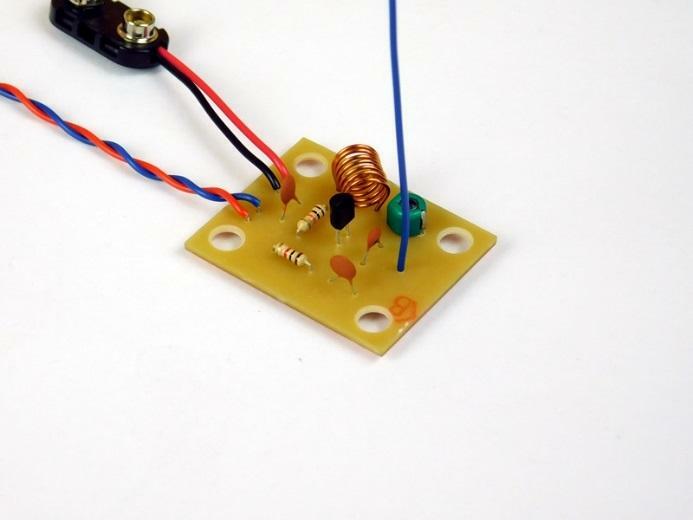 Build a simple 88MHz–110MHz FM transmitter using just one transistor and very few parts. 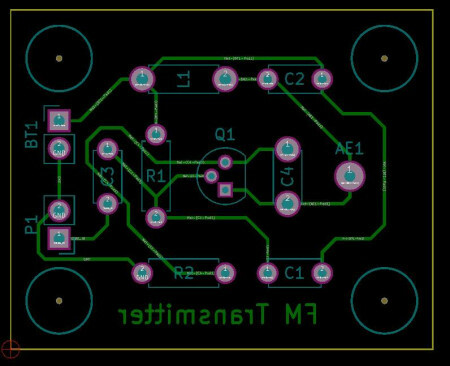 This project will demonstrate how a simple 88MHz–110MHz FM transmitter can be built using very few parts and just one transistor. The transmitter can be attached to just about any electronic circuit to transmit information (both analog and digital), to create spy bugs, simple satellite circuits, and even radio coms. How Does the FM Transmitter Work? The circuit has three main stages, the input stage, the modulation stage, and the output. The input stage consists of capacitors C3 and C1, and resistor R1. Input signals into the FM transmitter must not contain a DC component as it would adversely affect the modulation/oscillation stage (by saturating the transistor) and therefore no FM signal would be generated. C3 is used to couple the input signal so that no DC component is fed into the transmitter. R1 provides biasing for the transistor by feeding a small amount of current into the base (which prevents the transistor from turning off). The next stage is the modulation/oscillation stage which provides a carrier signal which is then modulated by the input signal. The oscillator consists of C2, L1, C4 and R2 with the frequency of oscillation being determined by C2 and L1 only. When power is applied to the circuit, a rush of current flows through the inductor. This rush of current will also pass through C4 via capacitive coupling which will result in current flowing through R2. Current flowing through R2 will result in a voltage drop across R2 and since R2 is connected to the emitter of Q1, the same voltage will be present on the emitter of Q1. This increase in voltage on the emitter therefore results in a smaller value of Vbe and this reduction in Vbe reduces the conduction of Q1. As C4 begins to charge the amount of current flowing through C4 reduces which results in less current flowing through R2. When this happens the voltage across R2 reduces which increases the size of Vbe and therefore increases the conduction of Q1. This increase in conduction results in C4 discharging and the whole cycle starting all over again. Modulation is achieved thanks to parasitic capacitances inherent in BJT transistors. Between the base – emitter, base – collector, and collector – base, are parasitic capacitances whose capacitance value depends on the base current. By altering the base current these values change as well and since the oscillation in the circuit is dependent on all capacitors and inductors in the LC tank, the parasitic capacitances also affect the frequency of oscillation. Therefore, by changing the base current you change the frequency of the oscillation which is how the FM (frequency modulation) signal is produced. 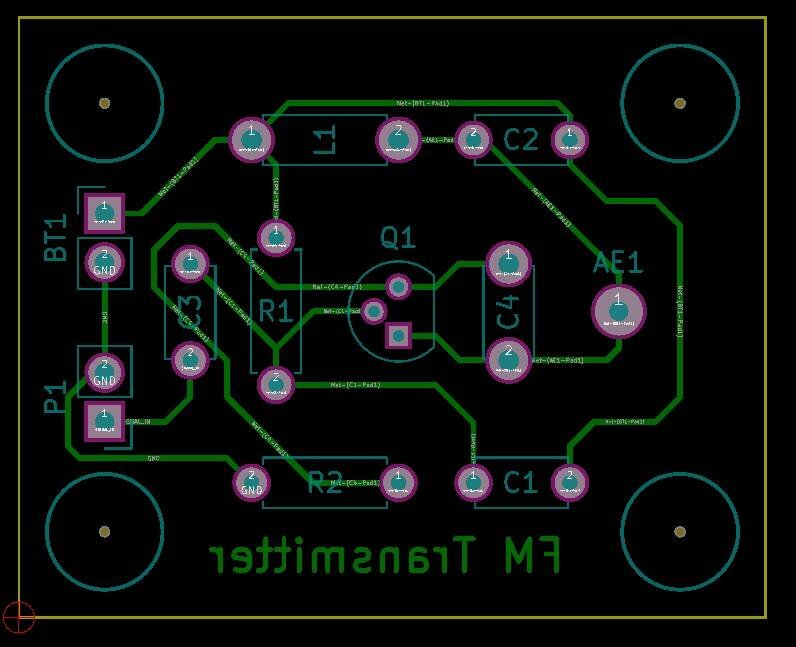 Emitting the FM signal is done by AE1 which is a long piece of wire. The modulated signal is fed into the antenna which helps to transmit the EM waves generated by the current as it oscillates. Using the FM transmitter is fairly easy providing that an external FM receiver is available. Start by choosing an FM frequency on the radio that is empty (to ensure that your transmitter does not interfere with other stations). 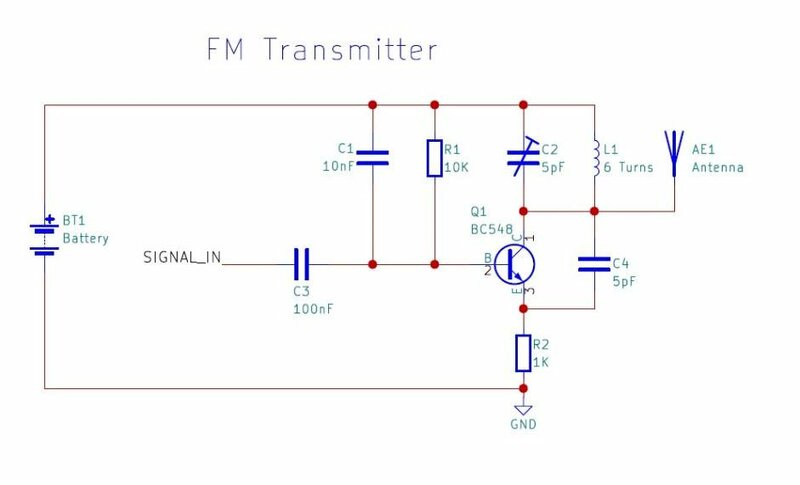 Then, feed a signal into the FM transmitter such as the audio output of an MP3 player or an electret microphone circuit. Using a plastic or other non-conductive implement, slowly tune C2 until the signal fed into the transmitter can be heard on the radio. At that point, the transmitter is broadcasting on the frequency selected on the radio and the signal should be detectable from up to 20 meters away.